How Does Breast Revision Work? Breast augmentation revision can involve replacing or removing implants, depending on the patient’s needs and goals. Some women wish to substitute their existing implants with a newer style or a different size. Others require repair, alteration or removal of the scar tissue surrounding the implant, known as the capsule. Revision procedures can also reduce the appearance of surface scars or achieve the same aesthetic goals as initial breast augmentation procedures such as improving symmetry or changing breast size. Dr. McLain will often incorporate breast lift techniques into breast revision surgery. 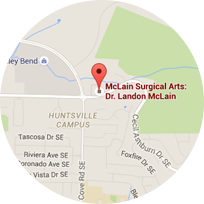 Dr. McLain’s breast revision procedures take place under general anesthesia. He offers a variety of implants, incision types and implant placements, depending on the patient’s needs. He will discuss the best approach for your particular needs during your consultation. Although revision cases can be more difficult than primary, or initial, breast augmentation procedures, Dr. McLain is highly skilled and experienced in addressing any corrections his patients require. He is adept at repairing even the most difficult deformities resulting from breast surgery.